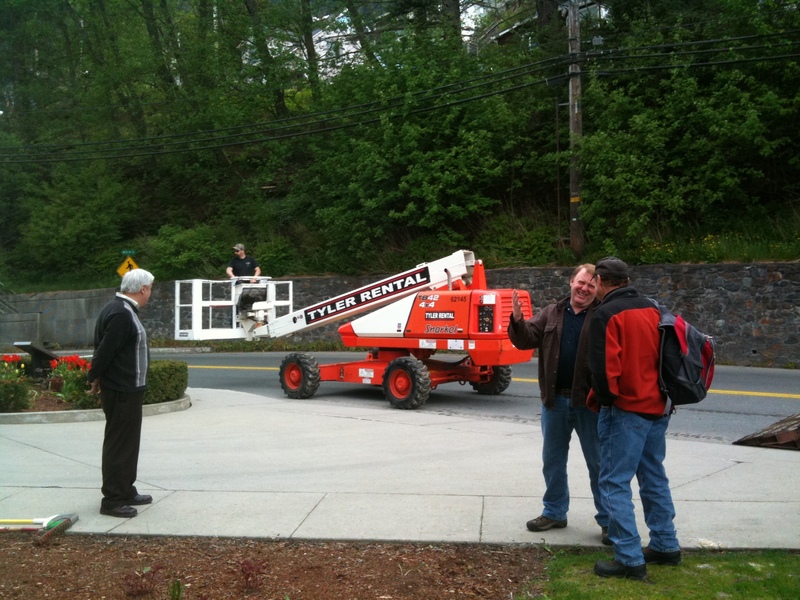 This entry was posted on Wednesday, August 18th, 2010 at 10:46 am and is filed under PROJECTS & IDEAS. You can follow any responses to this entry through the RSS 2.0 feed. You can leave a response, or trackback from your own site. 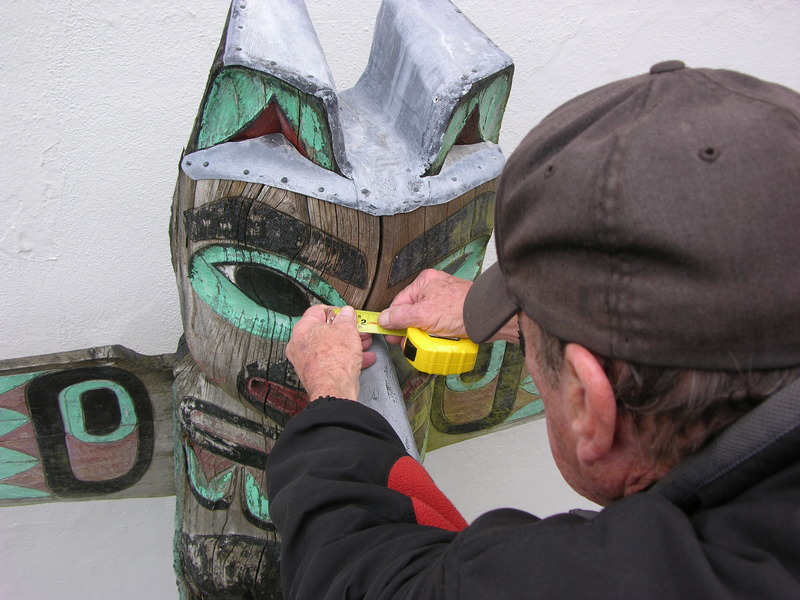 Hi: Thank you for your excellent, thorough, interesting site about the maintenance of totem poles. has been outside my parents’ house in the Southern California desert for 35 years now. It’s in good shape, except that the colors are fading. An acquaintance says there’s something I can coat it with so that the colors do not further fade, but he cannot remember the name of the product. Do you have any ideas? Thank you so much in advance for any help you can provide. I’m guessing that your friend means applying a coating that has an ingredient to filter ultraviolet light. I think the ingredient probably does more to prolong the life of the coating than to protect your paint from further light fading. Applying a coating (such as a clear water repellent) may saturate the surface and make the colors look a little more vivid, at least until the coating weathers a bit. But the UV filtering won’t do much to prevent fading of colors. I created a posting for you in order to illustrate this point: https://ellencarrlee.wordpress.com/2010/11/05/light-fading-from-uv/ (Hope that link works) Chances are, most of the fading that is going to happen has already happened. Ellencarrlee, you do great work!!!!! Those totems are pretty tall. I need your help! 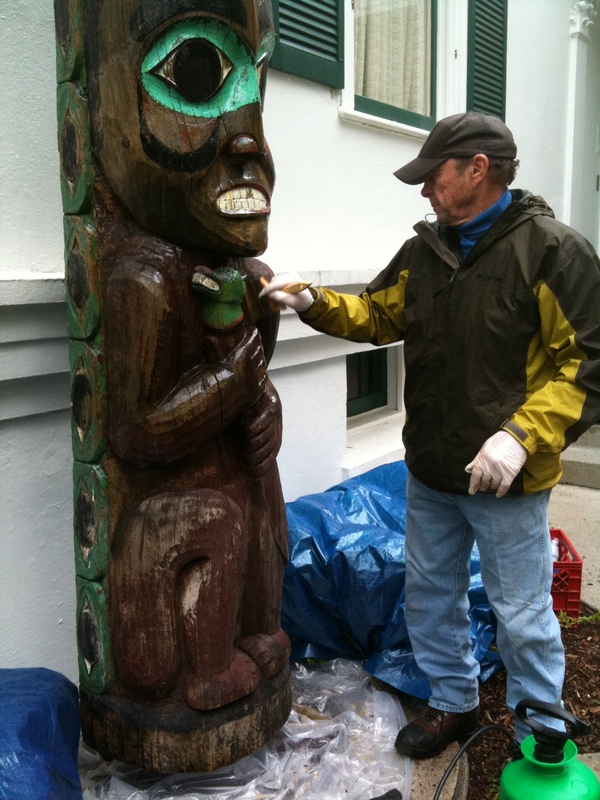 I had a 6 1/2′ tiki carved out of a palm tree about 10 years ago. I painted the outside with acrylic paints and set it next to my pool right on the ground (not a good idea). 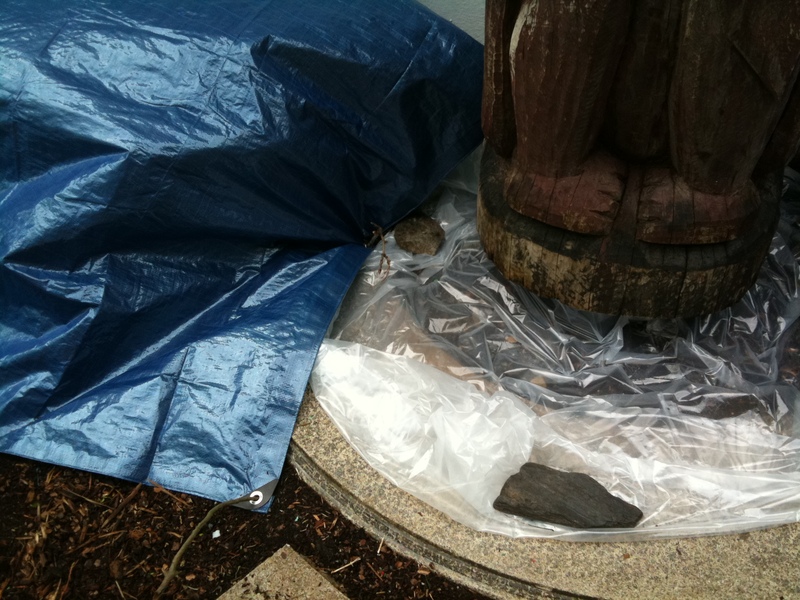 The acrylic paints have held well and protected the tiki. We’ve experienced a few bad hurricanes and during the last one I decided to set it down to avoid it from toppling over and becoming damaged. 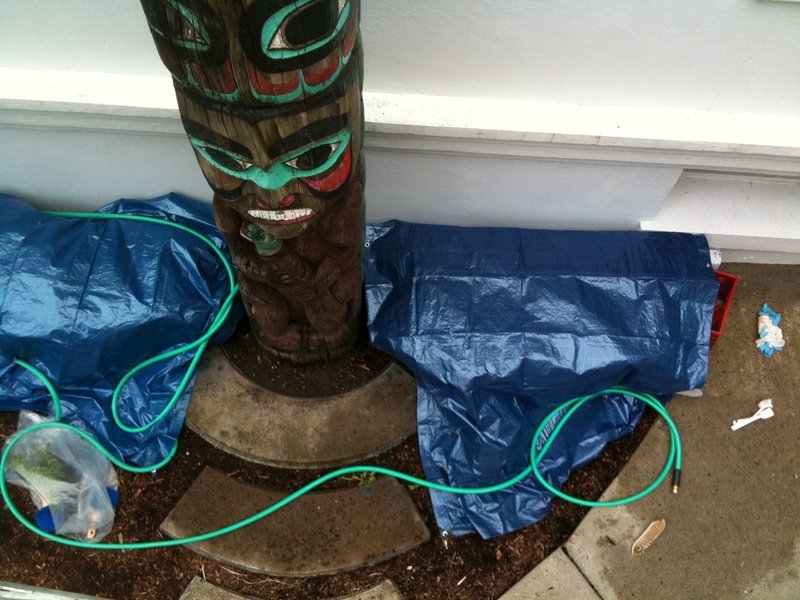 The tiki had adhered itself to the ground and was rooted. I pulled it out and set it on dry ground. 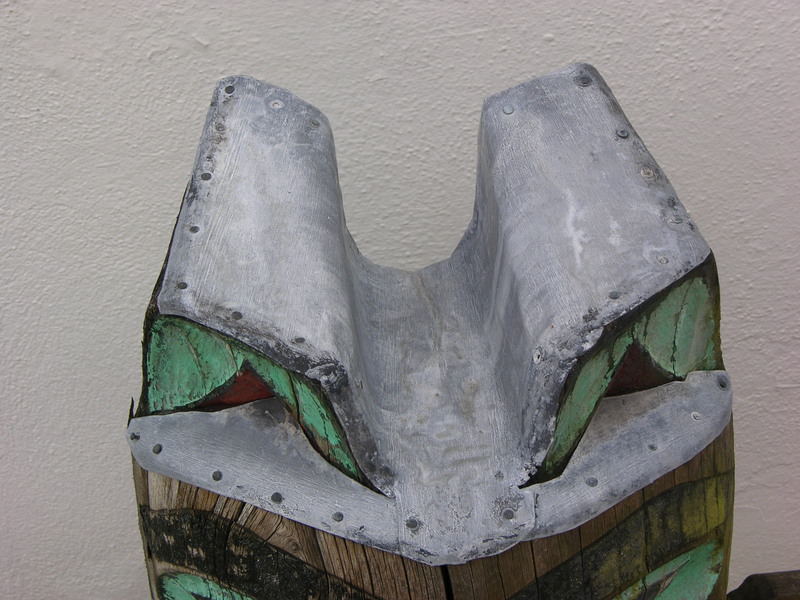 The base is now hollow along the inside about 12″ up from the bottom. 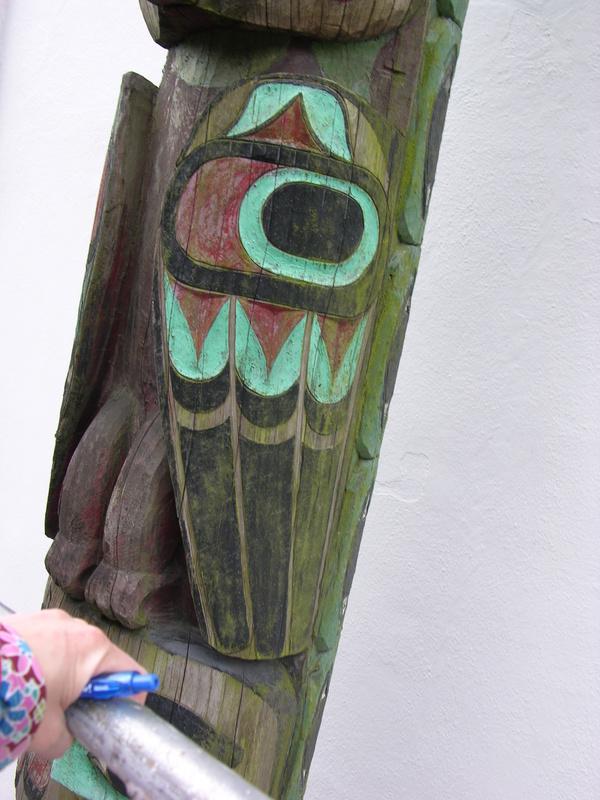 I don’t want to cut the lower 12″ of the tiki because it has feet and a nice base on the outside. I know if I stand it up it will fall over. I was thinking about filling the bottom with wood filler, plaster of paris. cement or some other hard material. The hollow area is pretty big so I thought adding some sealer type foam in the upper 4″ to 5″ might be okay. 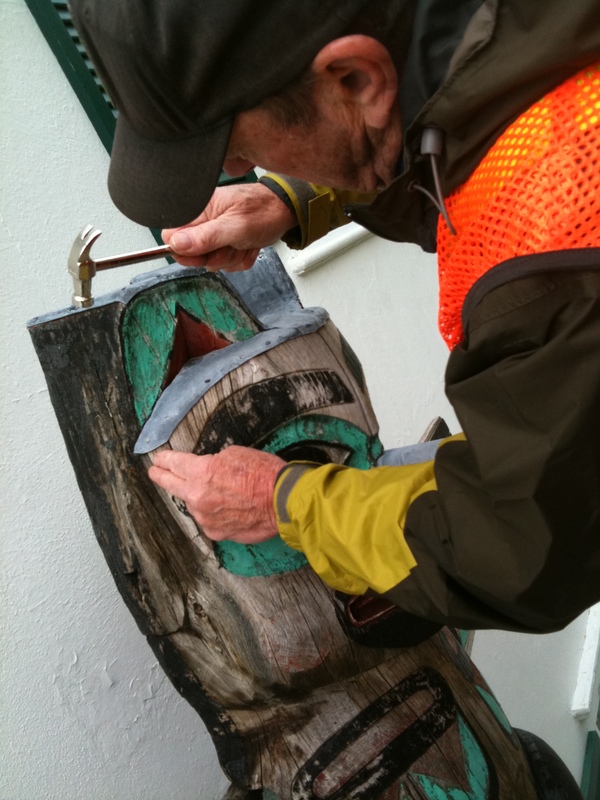 I would set the tiki upside-down and fill it in slowly allowing gravity to get the filler material deep into the tiki’s cavity. 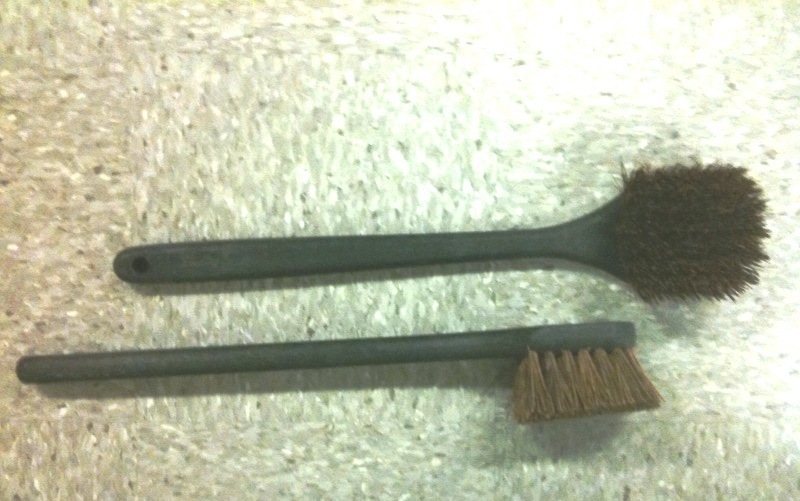 I would do about 1″-3″ every few days to allow the filler to dry. I want to fill the cavity with a material that won’t expand too much. After repairing the base I would like to set it on a concrete base in an area that can keep it dry and off the wet, humid ground. How can I save my tiki? I need your expert help please. Hard to tell what is the right solution for you without seeing an image or two. You could email them to me if you like: juneauellen (at gmail dot com). 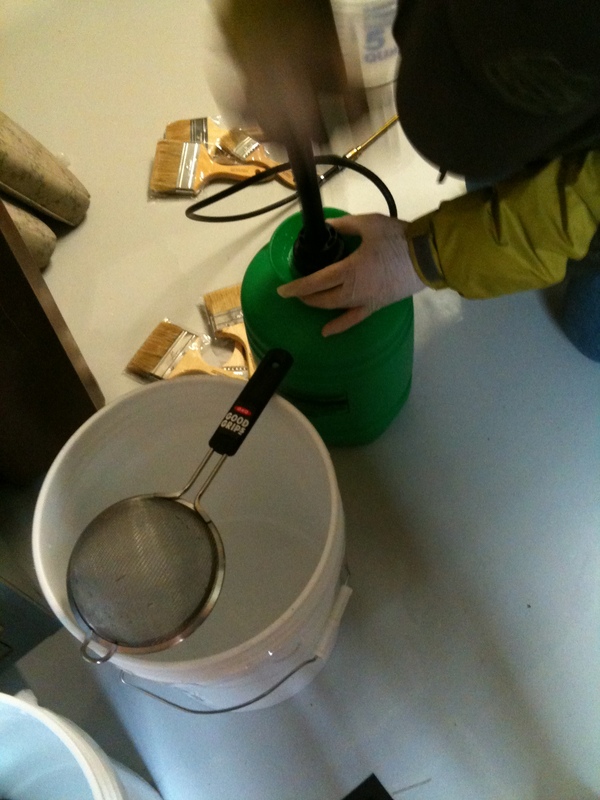 You are right to be cautious in putting a filler inside, especially something like concrete. Without seeing your sculpture, I think perhaps you might consider a strongback. That is, something like a metal or wooden post of some kind that would be mounted in the ground and give support for the sculpture, which could be bolted to it. 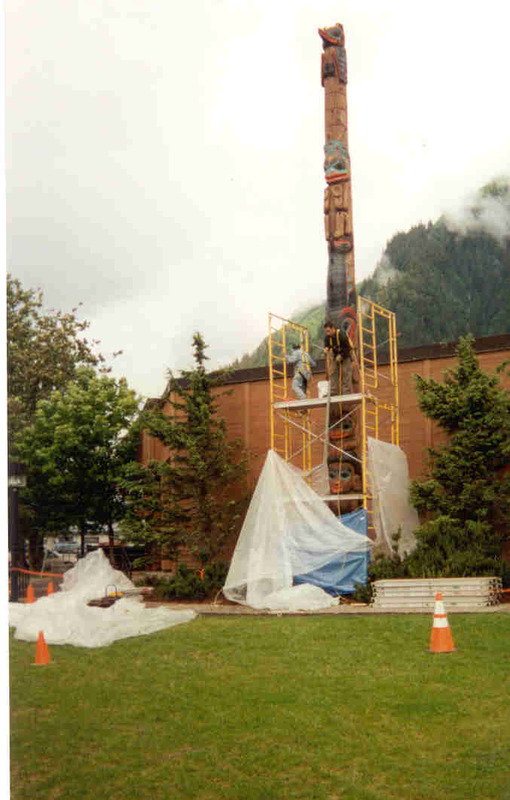 I’m intending to write a posting soon on mounting methods for totem poles, as the questions comes up frequently here in Alaska. 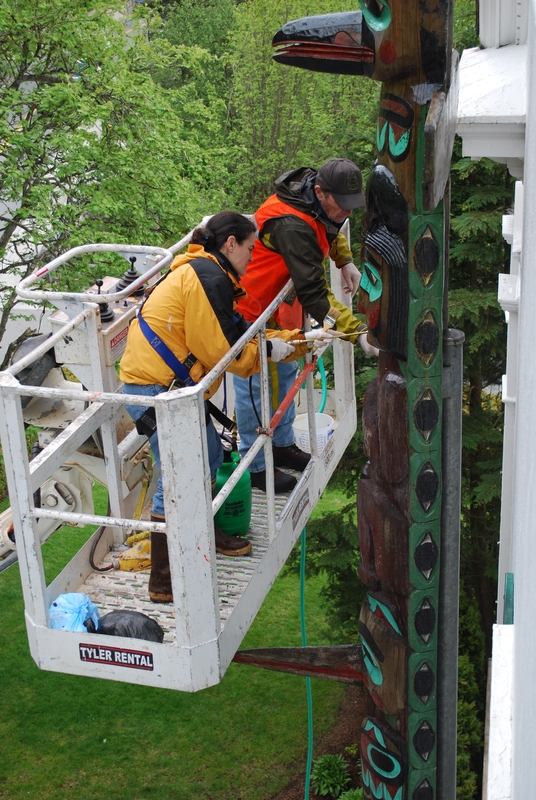 the totem alone and not applying any kind of protective coating? Thanks again! If you are in the southern California desert, I am not sure what putting a water repellent on the wood would gain you. 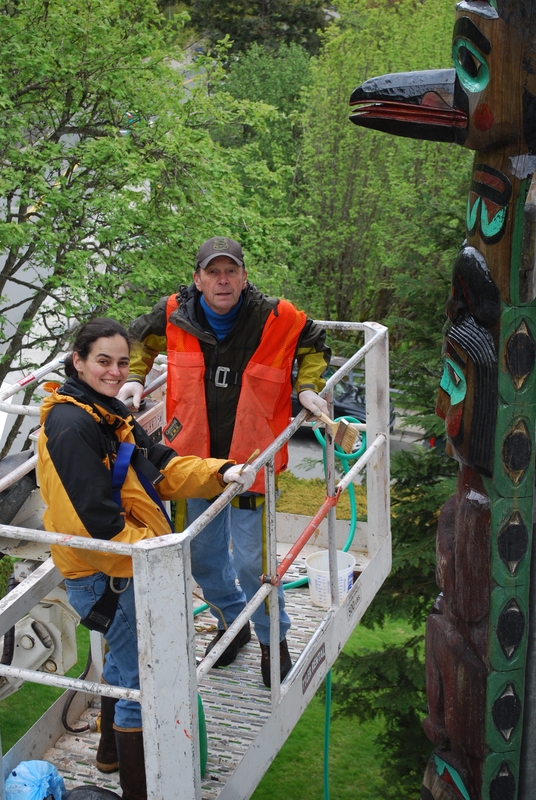 Here in the Tongass Rainforest, a water repellent is a crucial part of maintenance. I don’t think it would do much to lengthen the life of a pole in the desert. My inclination is to not treat the wood if you don’t have to. primarily indirect light and virtually no moisture, so I’m going to trust that it will be survive several more years and continue to remind me every day of my five glorious years living in Alaska. Thank you for providing an invaluable service with your work and website. 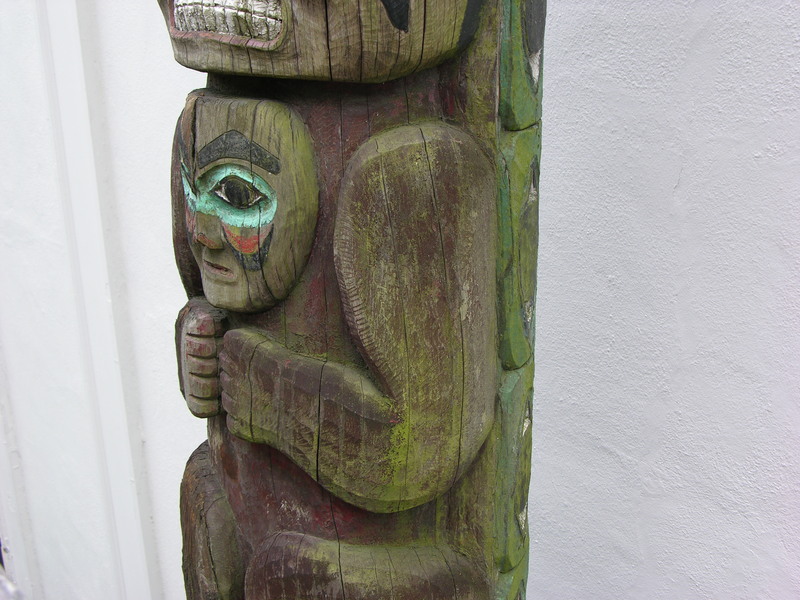 For most totem poles, using a supplementary strongback is the method with the most longevity. Putting the pole directly in the ground, which is the traditional method in its sultural context, results in problems around the base over time. Likewise mounting it in concrete. I’m working on a posting regarding ways poles have been erected, with images of various mounts. Let me know if you need me to send you some images sooner. This is so great Ellen. Thanks for your excellent work!! Hi Ellen, I am also with a scout troop in Pa and we are in the planning stages of designing a 20′ totem. How long do you have to wait to paint and waterproof the tree? We will be cutting the tree down in April. Thanks! Hi Ellen – Thank goodness for your site……it has been most helpful already. I have about a hundred questions for you. I have a pole that my Dad carved about 12 years ago. The pole is 13’9″ high. My Dad passed away 2 years ago and I now have this pole in my possession. It was moved last week……that was quite a feat! Anyway – now I can attempt to restore it. I have about 10 different pictures of the pole in regards to the questions I would like to ask you. My first question is where can I email the pictures to? 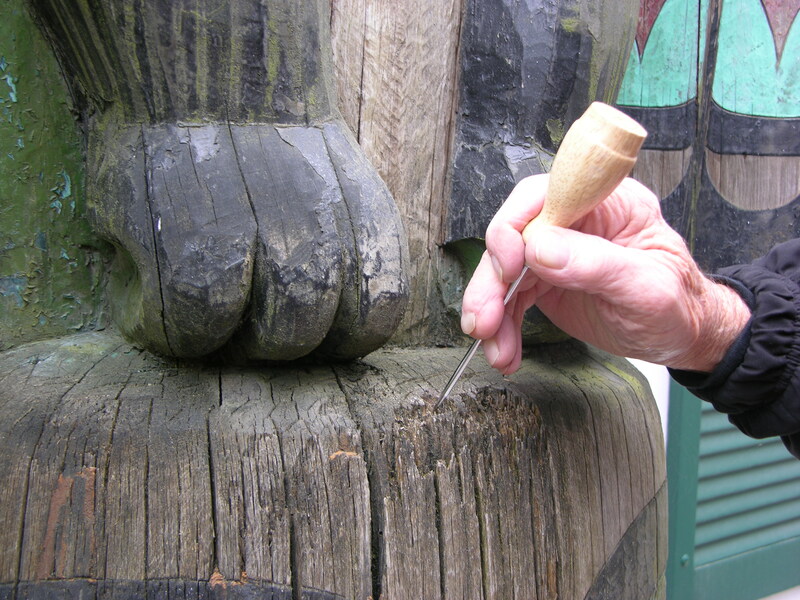 My main concern is remounting the pole……your site is most helpful and I like the idea of mounting it to a brace ….. kind of suspended rather than another way because I hate to cut it or loose any of the carvings. 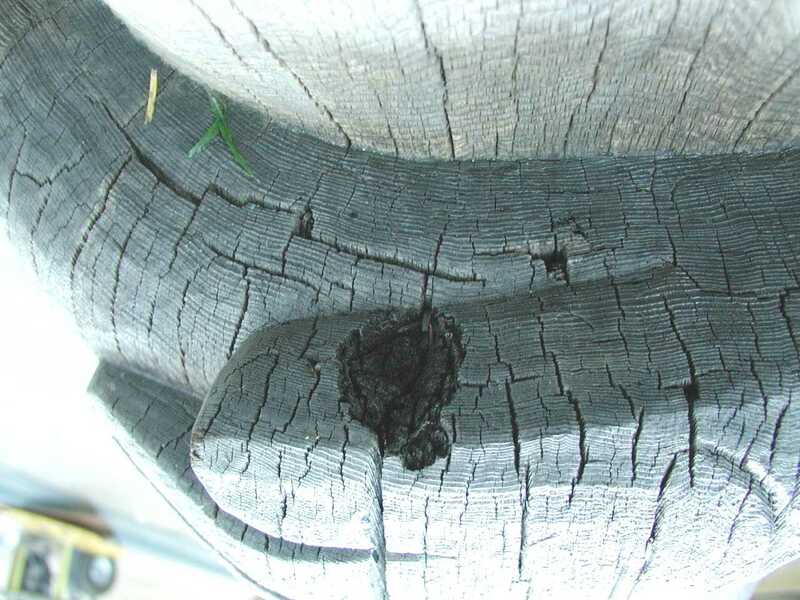 It had originally been mounted with a 1” steel pipe that went up into the center of the pole 2 feet. It had been mounted on concrete so it drew moisture……now as you can see in the three pictures of the bottom of the pole it has rotted some. The center where the pipe is looks like it is still intact and your ice pic test proves pretty well for about 1/4 of the diameter and about 8” in the core center. The entire base is 18” in diameter. So – question #2….what can I do about the bottom? What do you recommend? 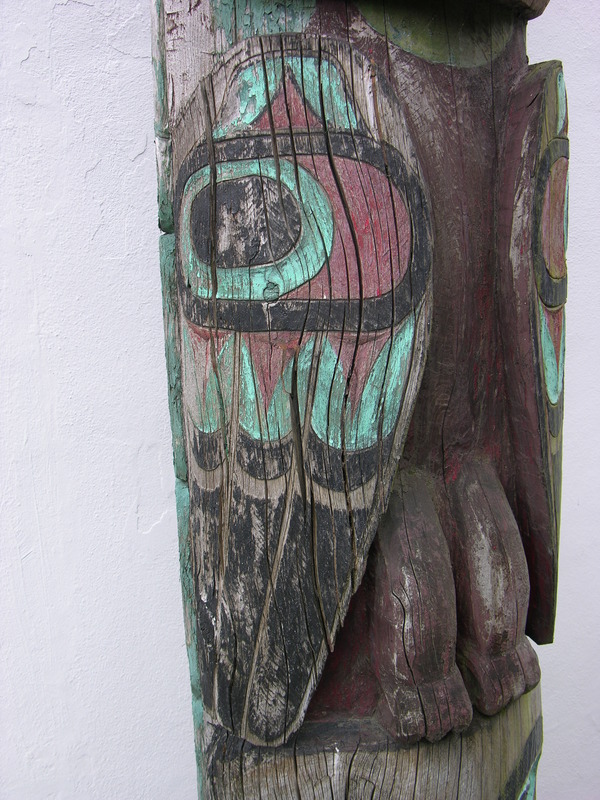 The pole is carved all the way around. 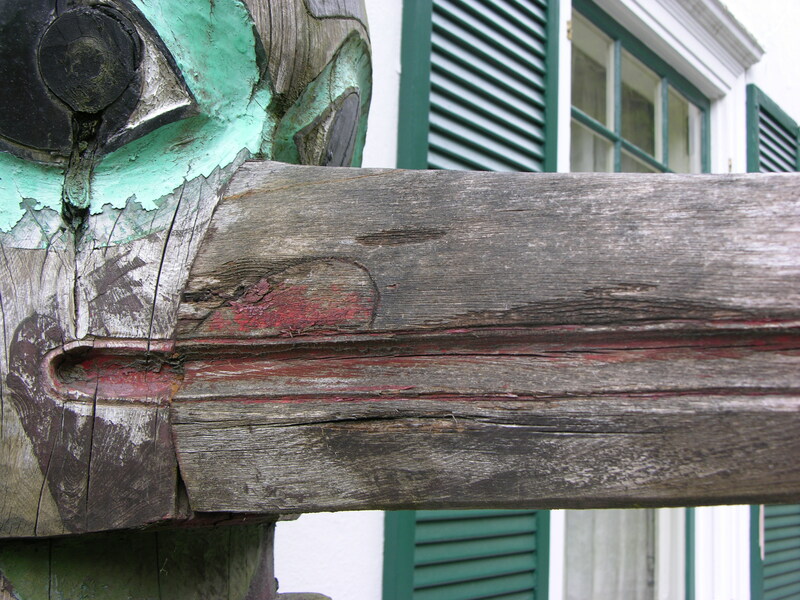 Rather than loose any carvings I would rather cover some of the carving up with steel beams or whatever kind of supports you are recommending for this method. What kind of beams? Are the beams mounted in concrete? Is the pole drilled all the way through? This particular pole has an offering hole 4’ up from the bottom. Is there a way to utilize this to help stand it up or brace it? What do I fill the bottom with that is rotted out? 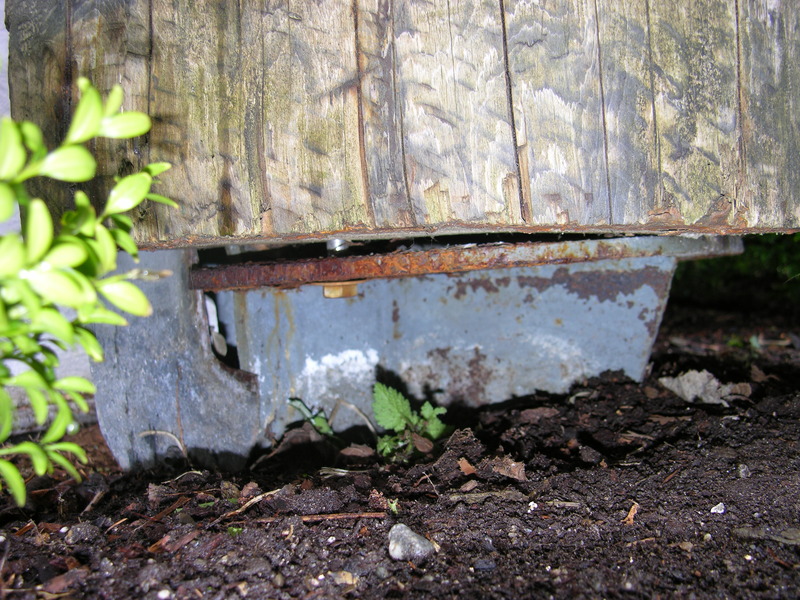 Should we still use a metal pipe along with new bracing? 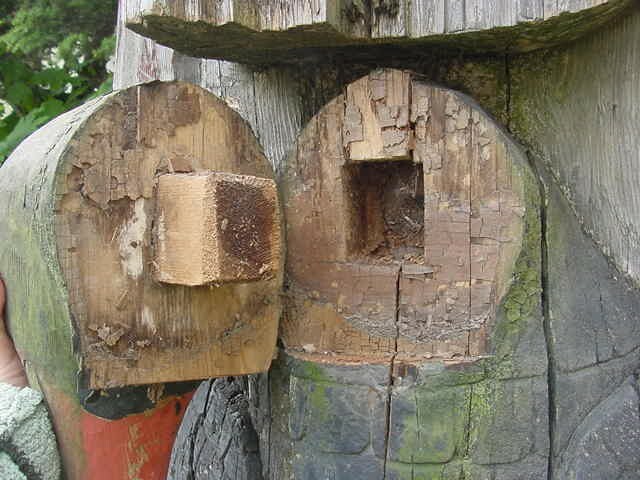 Regarding checking – Now that I have read your blog I am not sure what to do……There are a couple of place that look like “serious” checking……I used to live in a log home so I have an understanding of this. I see no need to fill a check unless it is more than something natural. The image titled “Hickman water groove” is an example of this……From the visual it looks like a check but it goes a couple of inches deep……the normal checks are not that deep. 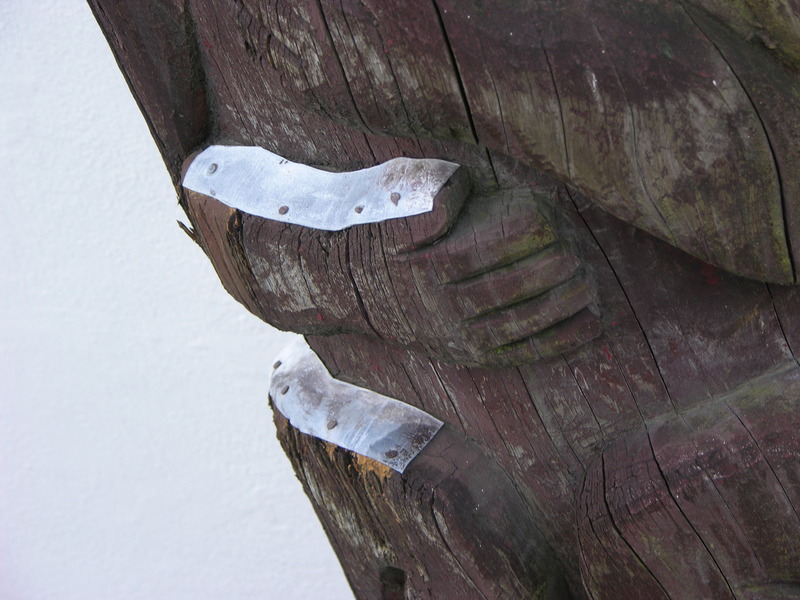 I can see with this example why you have notched some of the carvings in your restoration……and that would be great except that I do not have the ability to do this. So what would be the rule of thumb on filling checks vs a crack and how do I know the difference? 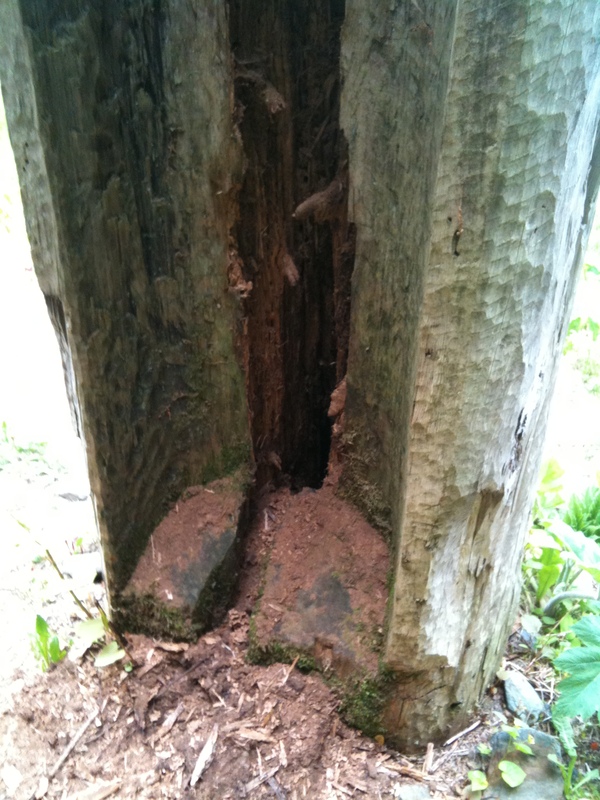 As you can see in the pictures it has been attacked by wood borers. 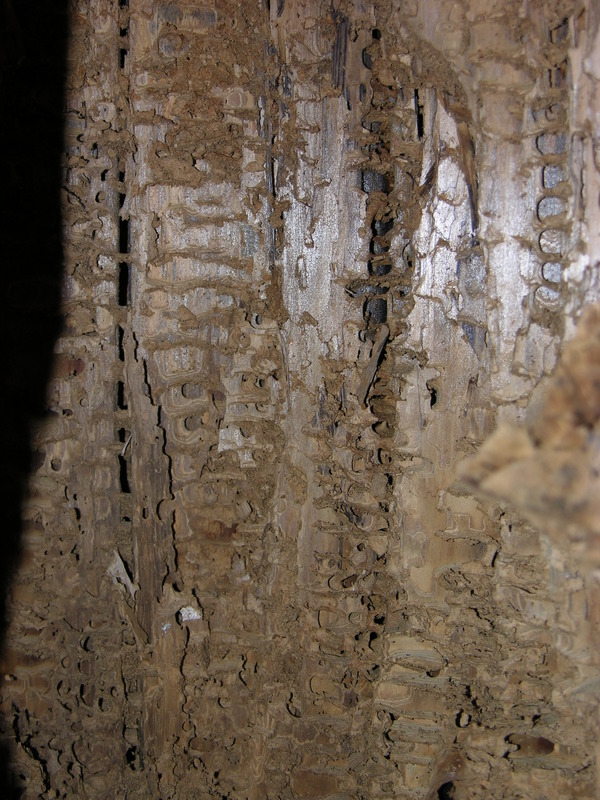 It was kind of like locusts one year…… anyway – the wood borer holes are about 1” deep. I am of the opinion that these holes should be filled with epoxy/sawdust. Do you agree? and if so what kind of epoxy should I use. I would like to touch up the paint but I dont know what to use. As you can see there has never been much paint on it to start with and in the beginning when the paint was fresh it was very muted and washed out. I would like to liven it up a bit but still want the same washed out effect. I only want to repaint previously painted areas. What do I use to do this with? Well – to start with that is my list of questions. I am happy to call you and talk on the phone rather than you typing everything if it would be better for you. If you have a private email you prefer to use then please email me any contact information and we can talk that way. I am happy to pay you for your advice. Thank you for all the knowledge that you have been sharing here. 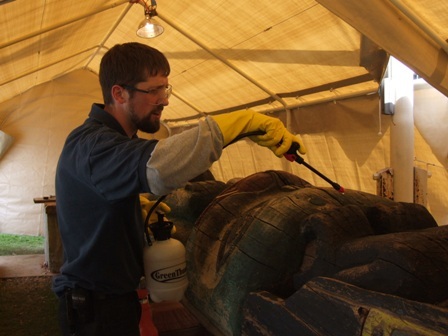 I had a chance to mount the Hunt Totem pole in California desert few years ago. I was pulling a lot of information from your generous posts on the web while working on it. If you are interested I would love to email you some photos of the mount, installation and the final result. I feel like you were a part of that project! 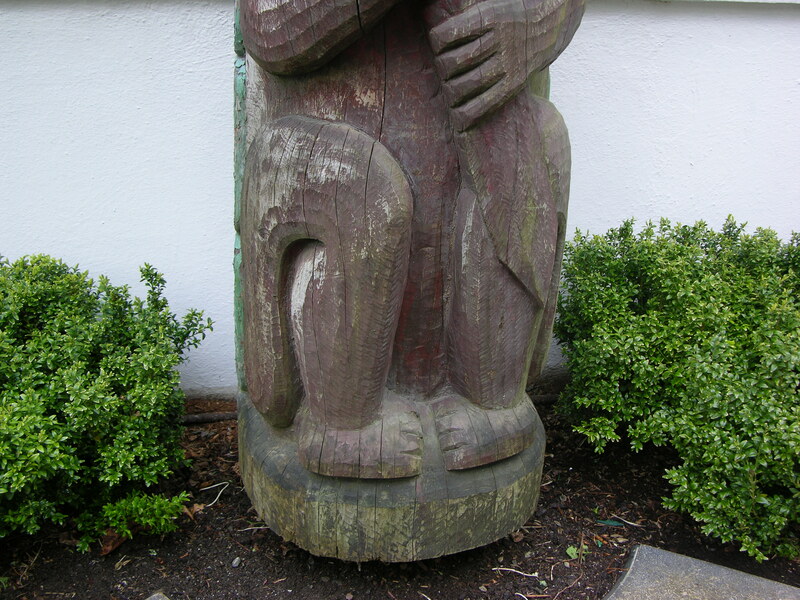 Hello, I have a tiki that’s been in our family for 50 years. My grandmother gave it away and I was lucky to track it down and get it back after 18 years. The previous owner traveled 300 miles to return it to our family. 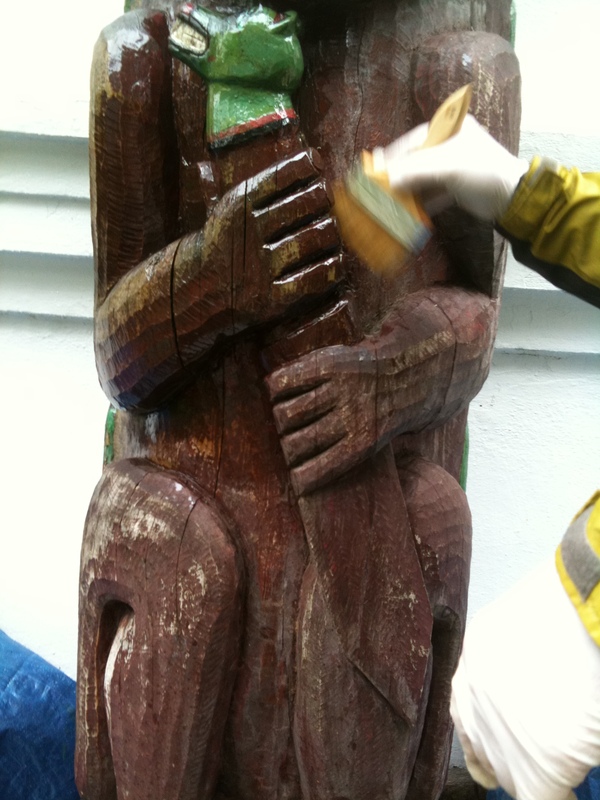 The tiki was kept outside in harsh weather conditions and no longer has the beautiful shiny brownish finish that I remember from my childhood. Now, the tiki is kept indoors, though it looks like gray fire wood. Can you suggest how I can return out tiki to it’s former glory? Hi! I’m not sure what you mean by tiki, which to my understanding is a kind of sculpture of a supernatural being from the South Pacific. The kinds of wood used and finishes applied in that region of the world are not at all in my realm of expertise. Wood kept outside until it becomes grey like firewood has undergone weathering and surface deterioration that has obliterated the shiny brown finish you remember. 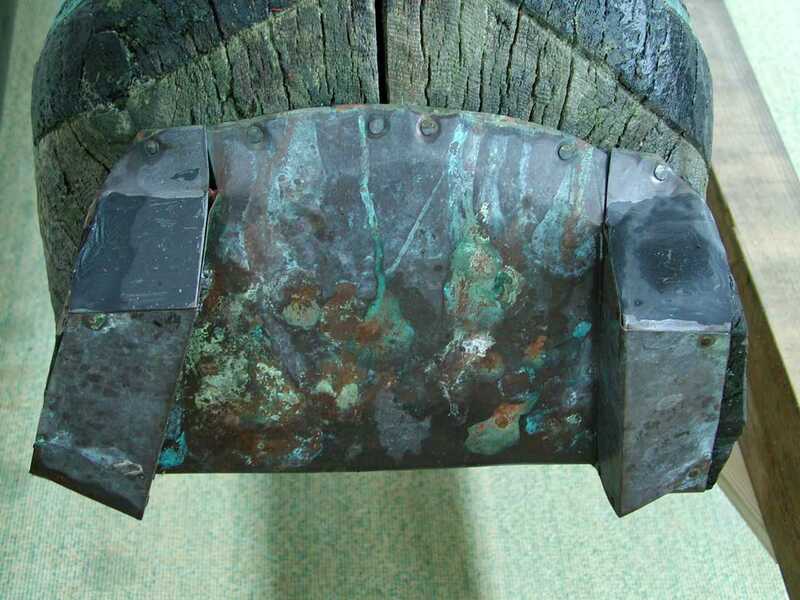 If you want to treat this item like a museum piece and it has high value to you, you can find a conservator to try to create a new, high quality (but reversible if necessary) finish that may replicate the look of the old one as well as documentation on what was used and why. You can find a conservator in your area on the website for the American Institute for Conservation http://www.conservation-us.org/membership/find-a-conservator#.Vfmfkk2IPcs If you are less concerned with the longevity and ethical aspects (and potential market or historical value), you could try to find a woodworker in your area, perhaps someone who is a furniture maker, who could replicate an appealing finish without the scholarly and cultural concerns about the authenticity and value of the item. 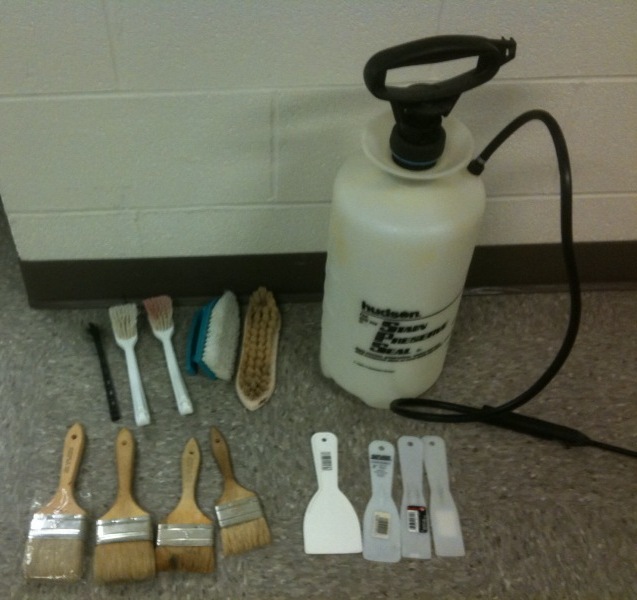 Finally, if it is simply sentimental value (such as for a tourist item) and you just want it to look the way you remember at minimal cost, you could go to the best high-end paint store in your area and talk to someone experienced on the staff there for do-it-yourself solutions to the surface appearance. Good luck!